Do you feel like learning a new skill is too hard to do? SkillUp Academy focuses on a major aspect of Education: Skill Development. There is no set curriculum, no enrolment fee, no teachers, no classes. There’s nothing getting in the way of your learning. It’s a place where you come to train online alongside other skill learners and share your experiences. We provide frequent LIVE training sessions on many subjects or skills and record everything for members to watch or listen to later on. The Library provides curated and peer-reviewed resources to learn any skill. We provide all the tools you need to succeed by practicing for as little as 15-20 hours per month. Many others have done it before you, and now it’s your turn! And this is such a small sample of all the great things the community has accomplished. People share their progress on any skills they learn, like Bouldering, Meditation, Country Geography, Superlearning, Podcasting, Calligraphy, Touch Typing, Portrait Photography, and more! Trainees in the SkillUp Academy also get added to The Forest community, which is, members of any of Forest Co’s programs — SkillUp Academy, Coworking, and Accountability. For the most part though, as a trainee, you set your own learning goals and record your progress any way you choose to. 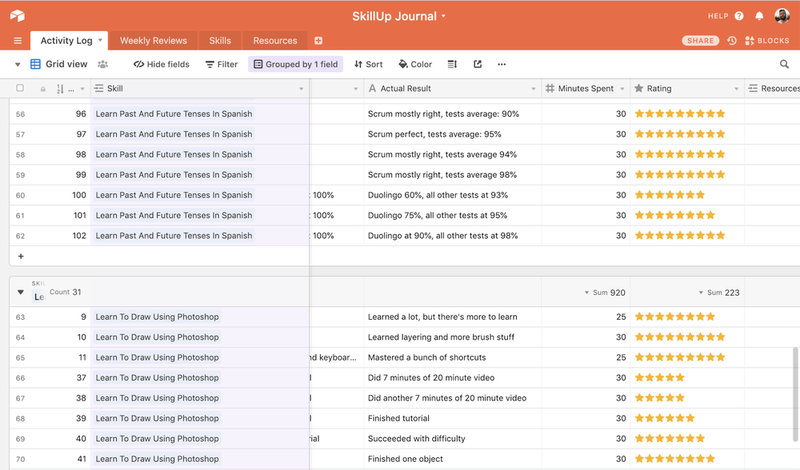 We do provide you with a free copy of the SkillUp Journal tool (value of $30) in case you want to use it. From there, you can share your progress with the community on our exclusive Slack channel, for extra accountability. Sounds awesome! Let me in! What kind of commitment is expected of me? It’s your learning. We’re never going to be in your way or hold your hand like in high school. If you can commit a few minutes every week or many hours a day, that’s all good. It’s not a competition, and not everyone can afford to spend a large amount of time on skill development. Our founder, Danny, spends at least one and a half hours on deliberate practice. You can catch him training in one of the dojos every morning starting at 6am (Eastern Time). Sounds Reasonable. Count me in! I'm a top writer on Medium.com, writing about Learning, Productivity, Inspiration, Self Improvement, Entrepreneurship, Life, Life Lessons, Startup, Photography, Travel, and more. My stories have inspired over a million people around the world. Back in September 2017, I felt like skill learning was tedious, hard, and not particularly fun. I wanted to get better at a lot of different things but I felt something holding me back. Do you you feel the same way? In the course of the next 12 months, I lived in Spain, India, Canada, and now I’m in Colombia. I started 3 businesses, wrote 3 books (with two bigger ones in process), wrote 300+ articles on productivity, learning, life lessons, etc, became a top writer in 16 categories on Medium.com (including top 1 in Travel and top 3 in Inspiration), became healthier, opened my own coaching program, learned 42 valuable new skills, etc. What changed? What made it so I would be able to thrive the way I did? The simple answer: I became more skilled. Never did I expect it would have such an impact on my life and the life of the people I coach. Learning new skills has always been an obsession of mine, but where does one find time to even practice new skills, right? Because I didn’t think I had time, I never did anything with my obsession until September 2017. I woke up one day and decided NOW was the time. On that fateful day, I decided to deliberately learn 3 new skills every month, practicing 30 minutes each skill every day, for a total of 1.5 hours a day. How did I find the time, you ask? I’ve always been able to help my clients find the time to learn new skills. It turns out that everyone has more time in their hands than they think. The key is to learn things that you’re interested in, in which case skill development becomes a hobby and not a chore. In the past year alone, I’ve deliberately learned at least 42 new skills. Today, I can help people in many industries I never thought I’d even dream of being able to (like eCommerce and Dropshipping). And all it took was 45 hours of deliberate practice per month. I could not agree more. And I say that from experience, both my own and that of my clients. Are you ready to SkillUp your Life? 6. A Free copy of Danny’s new book: SkillUp Your Life! I so want in! Let's do this! Be sure to check out the Free Resources section where you’ll get plenty of really helpful advice. When you’re ready to upgrade, check this page out again! Hope to see you soon! Photo of me representing all 10 skills people want to learn in 2019. Can you guess them all? I want to learn these skills too!